Performers include: Orlando Jones, Rob Estes, Marin Landau, Amanda Krampf, Anita Briem, Samantha Ferris, Christie Will, Jodi Lyn O’Keefe, Carl Anthony Panye II, Kira Clavell, Henry O, Stephen Chang, Al Cacioppo, David Hodges, Donn Andrew Simmons, Jason Lewis, Noelle Beck, Mark Adair-Rios, David Pearl, Rob Bruner, Christina Grandy, and C. Andrew Nelson. 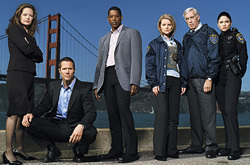 A detective series that revolves primarily around the cases and lives of two San Francisco Police Inspectors; Sean Cole (Rob Estes) and Cayman Bishop (Orlando Jones). The critical pieces of evidence are presented at the beginning of each case and the detectives, with the help of Dr. Sol Goldman (Martin Landau) and Emily Stevens (Anita Briem), must piece together the events that led to the crime. Sean is concurrently trying to solve the year-old murder of his wife Julia.